In contrast to any other room in a home, the most-used space is likely the master bedroom. It is the place where homeowners rise and prepare to face each day, the place where they relax and retire at the end of the day, and the place where they get seven to eight hours of sleep each night; based on these everyday routines, homeowners might spend as much as 30-35% of every 24-hour day in their master bedroom. So why, then, does this room often receive considerably less time and attention than other areas of the home when it comes to choosing its furniture? Since it might be the most-used room in a majority of homes, should the choice of bedroom furniture and décor not receive priority consideration instead? Age – is wear-and-tear affecting its look/performance? Style – acquired through a previous generation of family? Size of various pieces restricting access to drawers/closets? Changes in personal taste and/or needs since time of purchase? Ambience – is room devoid of character due to a mismatched set? Bought for a former residence and not suitable for the current space? Incompatibility of bedroom with the style/décor of the rest of the home? Whatever the reason, it is quite possible that the furniture in many master bedrooms within the GTA has been in place for many years, and the respective homeowners have essentially surrendered to the notion that it is ‘still good’ or ‘good enough’ for their needs. But neither of these mindsets are indicative of complete happiness, total comfort, or pride of ownership in their bedroom set; realistically, it also means that the time for buying new furniture has arrived (or maybe has already been here for quite some time). Furniture style/décor – classic, vintage, modern, or rustic? bedroom’s colour scheme? Space saving options – bed with built-in drawers? wall-mounted shelving or television? Equipped with this type of information, homeowners will now be better prepared to address the physical aspect of choosing their bedroom furniture; the onsite shopping stage. Though this too can be overwhelming, not to mention time-consuming, it can be simplified by a visit to the Carrocel fine furniture showroom, located on Bridgeland Avenue near Yorkdale Mall in Toronto. The Carrocel fine furniture showroom offers the convenience of a central location without compromising on the quantity and quality of bedroom furniture from which homeowners can choose. This 20,000 square-foot showroom provides an opportunity to compare and select from an outstanding collection of bedroom furniture sets and designs; shoppers can browse among individual pieces and complete suites of various styles and colours to suit their needs and tastes. For a complete preview of the many other bedroom pieces and sets currently available from the Carrocel fine furniture store, visit our Bedroom Furniture page. 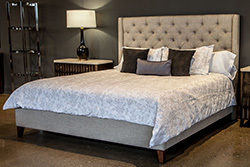 Looking for help in choosing the right furniture for your master bedroom? 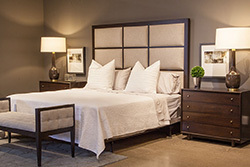 Call the bedroom furniture specialists from Carrocel fine furniture today at 647-694-4683 or Contact us to request a complimentary consultation; or feel free to visit our 20,000 square-foot showroom at 245 Bridgeland Avenue in Toronto to view our superb selection of bedroom furniture sets.